"What happens in costume at comic-con stays at comic-com." Entertainment Earth Convention Exclusive: The Big Bang Theory 3 3/4-inch scale action figure set of 4. The Big Bang Theory boys cosplay as Star Trek: The Next Generation characters. Figures have 5 points of articulation and include pop-out dioramas. Each limited edition figure set package is numbered. There is no convention too big or small that The Big Bang Theory men won't attend (well maybe Bakersfield, but they still go anyway). 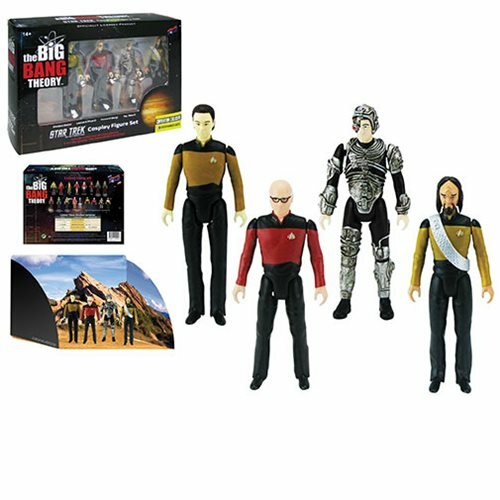 Recreate their "trek" across the desert in full costume with this 3 3/4-Inch scale special edition The Big Bang Theory / Star Trek: The Next Generation cosplay figure set made exclusively by Bif Bang Pow! for Entertainment Earth as a convention exclusive! These intricately detailed figures are designed and inspired by The Big Bang Theory's sixth season episode titled "The Bakersfield Expedition" where the three genius physicists (and Howard) attempt to attend the Bakersfield Comic-Con as characters from one of their favorite television shows! Prototypes were made by Gentle Giant to capture all the fine details of the figures. All figures feature 5 points of articulation, including: neck, shoulders and hips. As an added bonus, the packaging unfolds into a pop-out diorama of a unique location from the episode! This is a limited edition The Big Bang Theory variant figure set !It's enough to make you exclaim, BAZINGA!™. Ages 14 and up.